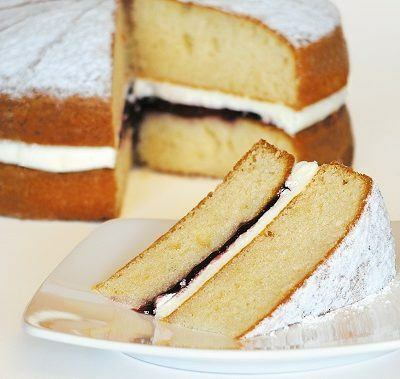 A deliciously light buttery sponge, filled with a layer of buttercream and raspberry jam. Frosting (18%) (Icing Sugar, Butter (Milk), Vegetable Margarine (Palm Oil, Rapeseed Oil, Water, Emulsifier: E471),Water, Flavouring), Sugar, Egg, Rapeseed Oil, Raspberry Jam (Glucose Syrup, Raspberry Puree, Sugar, Acidity Regulators: E330, E331; Gelling Agent: E440(i); Colour: E163), Water, Cake Concentrate (Modified Starch (Waxy Maize, Potato), Wheat Starch, Raising Agents: E450(i), E501; Wheat Flour (Wheat Flour, Calcium Carbonate, Iron, Niacin, Thiamin), Emulsifiers: E471, E477, E481; Rapeseed Oil, Glucose, Preservative: E202; Wheat Protein, Acid: E330; Stabiliser: E415), Sweet Dusting (2%) (Glucose, Cornflour, Palm Oil), Humectant: E422; Flavouring, Raising Agents: E450(i), E501. Produced in a factory that also handles: almonds, brazil nuts, cashews, hazelnuts, pecans, pistachios, walnuts, sulphites, mustard, sesame. Hand-finished 9” diameter cake, each pre-portioned into 14 slices, and sold frozen for you to defrost when needed. Once defrosted, store cake at room temperature – not in the fridge. 5 days shelf life from defrost when stored under a cake dome or equivalent. At the end of a business day, it is advisable to wrap the cakes back up and store in a cool, dark place.